Australia's carbon tax losing public opinion big time | Watts Up With That? It seems Australians are waking up to the folly of a carbon tax. I’m sure Mr. Flannery’s quote of the millenium helped bunches. Ms Gillard yesterday vowed to press head with the carbon tax plan despite poor polling and the campaign from the Opposition Leader. “I’m interested in the policy cycle not the political cycle,” Ms Gillard said. The voter opinion turnaround is testament to the hard work of my sceptical friends in Australia. Good on ya! As I’ve said twice before, ‘Global warming was cute, understandable… until everyone realized that the government wants to TAX us NOW… to reduce the temperature ONE HUNDRED YEARS from NOW!’ What sane citizen wouldn’t see through such a folly? To be fair, Julia Gillard is probably sensible enough to know that a) there is no evidence for AGW and b) even if there were, a carbon tax in Australia is going to have a negligible effect. Unfortunately she is running a minority government where the balance of power is largely held by the Greens, and where one Prime Minister has already been sacrificed because of his support for a carbon tax (coupled with general dithering incompetence). To push through a carbon tax now will probably bring down the government: but to make an embarrassing backflip will have the same effect. I suspect what Gillard is hoping for is some ‘unforeseen’ circumstance to hold up the introduction of the carbon tax until enough people have come around to the view that it is better buried; then the Greens can be dumped and sanity will prevail. The temperature has been steady or dropping for 10 years …. they are trying to tax you before people realize what is really going on … a tax excuse. Want to reduce your ‘carbon foot print’? Remember to wipe your feet, before you come in the door……. That to secure these rights, governments are instituted among men, deriving their just powers from the consent of the governed. That whenever any form of government becomes destructive to these ends, it is the right of the people to alter or to abolish it, and to institute new government, laying its foundation on such principles and organizing its powers in such form, as to them shall seem most likely to effect their safety and happiness. Sounds to me like some alterations are in the cards at some point in the future. Unfortunately Anthony, just as in other parts of the world, the alarmists are determined to go down kicking and screaming. They are becomign obsessed with the notion that their wonderful policy that stinks to high heaven, just isn’t being ‘sold’ properly. In addition, theyare ramping up the rhetoric, as exampled by this comment from one of the principle climate change spruikers, Clive Hamilton. Note: Bob Brown and Christine Milne are our resident radical greenies. Of course the unwritten “fact” in all of this is that Clive sees himself as the one to assume power. Political suicide for the ALP, but they have another 2 years in power. The problem is, the Libs are committed to climate change as well. Being a political animal, how long will it be until Tony Abbott sniffs which way the wind is blowing and go back to saying “Global warming is crap.” Soon I hope. But the same survey found 72% thought humans have some influence on climate change. I am surprised there is no comment on the Canadian elections. The Conservatives who will form government in their own right had a policy disagreeing with any carbon tax, any stronger environmental regulation, and a continuation of encouraging oil sands mining. Voters have approved these policies and rejected the environmental policies of the Greens and Liberals. I think there is a world move to reject AGW. I hope that the vote will be a some encouragement for Dr Tim Ball in his defence against Mann and Weaver. I’m pretty sure more than 60% is against this Carbon(dioxide) Tax. I get about the town a fair bit and have not come across anyone who is for it. Also, I got involved with a phone survey and when they found I was over 60, they didn’t want to here what my opinions were. Next time I said I was 55 and went right through the questions, about the carbon tax. Just another way of fixing the results. I guess us oldies don’t have a clue anymore. Also, Prof. Bob Carter is speaking at the Hervey Bay RSL tonight, starts at 6:30pm. I’ll be there with my WUWT Tee shirt on !! BTW, from my note over in the notes and tips, I’m using the Optus wireless broadband mobile modem right now to connect to WUWT, TPG has still got me blocked. Gillard is still trying to sell the tax, and failing. People are, FINALLY, realising that someone like economist Ross “Gold Mine” Garnaut, the Govn’t climate change adviser, have not one clue about the science behind climate change or the physical properties of Co2. As I’ve posted before, Ross was out of his depth a while back on an SBS show called “Insight”. He was blabbing and spluttering and did not answer a single question directly. Same too with Gillard, no answers, no policy. People can see it for what it is, a tax to bring the Labor Govn’t in to surplus before the 2013 election. Me thinks things will happen before that. Julia has many attributes. Like a pitbull does. And she shares the lack of intelligence, discernment, and temperament. It is difficult to decide whether she is simply graceless or a disgrace. One thing is sure, she is uneducated. Her behavior echoes the actions of most other socialist ideologues on warming. Something is afoot here. Why did she vow no tax, then immediately reverse course? Either deception or vast sums of money (or both) are in play here. The Minions of the U.N. have surely offered bribes to every constituent to play along. I think we can still thank Climategate, and whoever released the emails, for people’s continued reluctance to listen to lies. In the wake of Climategate, from memory, the 20% core of skepticism abruptly became 30%+, and the road to eco-serfdom suddenly filled with potholes. Pigheaded is a rather gentle term for “thick” in this case. Canadian Voters recently withdrew support from Pols interested in taxing carbon as part of their election platform, a fact that Ms. Gillard should perhaps take heed of…but I think the likelihood of unnaturally-airborne farm animals is greater. Cementafriend, you beat me to it. The Canadian Conservative party can now be a lot more overt in rejecting the junk “science” of CAGW. I’m hoping that Steven Harper still holds his views that he expressed as leader of the Canadian Taxpayers Federation that CAGW was a crock. Now that he’s Prime Minister, and has a majority government, it will be safe for him to express those views again. I’m hoping that Canada can be a world leader in debunking CAGW and that Vaclav Klaus won’t be a lone voice speaking the truth among national leaders. We’ve had M&M demolish the hockey stick and hopefully they will now receive some recognition in Canada from the government. Both opposition parties in Canada were for a carbon tax and the voters have spoken. It remains to be seen if the BC government sees the light and eliminates its progressive carbon tax or whether they are just too addicted to tax revenues. My sympathies to the Australians and my advice is protest vocally now as taxes, once they are established, are harder to get rid of than getting a junkie off heroin. Governments, regardless of political party, are addicted to tax revenues and the best thing is to not allow them to get their hands on a source of income. Somehow we have to force an election before this idiotic tax gets shoved up our noses, (its certainly on the nose). Anyone any ideas how we can rid of this deceitful ALP/green government ? Indeed Boris. Once the taxes go on they’ll be very hard to take off. Fight this tooth and nail. Let Gillard know that appeasing the Greens (and outright lying!) will not be tolerated. Why can’t politicians see that a carbon tax will only put up the cost of living without having the slightest effect on carbon emissions. The lying by, and the shear effrontery of this woman will bring Australia down to its economic knees. The rational and sensible thinking majority must work harder to have this dangerous and stupid woman removed from office as soon as possible . We in Britain give you our full support and are all hoping that the ultimate downfall of those irrational AGW fanatics in Australia will show our own politicians in the UK that following a hard line policy on taxing everyone in the country on carbon emmisions will lead to their ultimate downfall also. We are watching you with hope as I am sure that a clear and positive ‘NO’ by you Australians will mean the beginning of the end for the dangerous AGW cult across the world. The Conservatives [Tories] refused to knuckle under to the main stream media, Greenpeace, WWF, Suzuki and every other CAGW zealot. Every other political party in the Canadian election paid the Gaia stipend. Canadians voted on May 2, 2011. The Conservatives won a Majority government. There will be no carbon tax, no cap-and-trade, no UN climate change deals and no green destruction of our economy for at least four years. The Prime Minister thinks the whole CAGW is thing is false, and has said so. Does any other political party in the developed world have the guts to completely, completely ignore the ‘Big Green Machine’ during an election campaign? It will be interesting watching the rest of the developed world devolve while we use our vast energy resources to build our economy. Be patient Australia and America, your chance will come soon enough. Great Britain; sorry, too bad so sad. My comment is about the 1993 Canadian election, and the wipeout of the governing Progressive Conservative Party, who were so on the nose they lost all but 2 seats. They were completely gone by 2003. So Ms Gillard should be careful – by ignoring us voters she just might cause her party to become a real climate change related extinction. The political situation in the UK seems all but hopeless. I’m just hoping that (not for the first time) all you folks from the Dominions and former Colonies will get your acts together and come and help us out! The lowering of our standard of living is precisely what the liberal politicians want to achieve – the fools are those who believe that it’s all about mitigating the future climate. It sort of is, but they have the wrong climate – it ain’t the weather climate they want to mitigate but the wealth climate. Pat – some of the cleverest people I know are “uneducated” – the intelligent poor usually. And amongst the educated there are many stupid people – .the rich but thick usually. The two qualities shouldn’t be conflated. JG should, I agree, pay more attention to the preferences of the public – that’s the essence of democracy after all – but the ship of state can’t allow itself to be blown about too much by the changing winds of public opinion, which is still too sensitive to the sensationalising of certain elements of the MSM. A pity she doesn’t know about the carbon cycle as well! ‘One of the big issues in the next Australian election campaign is likely to be whether the voters believe Labor can responsibly manage the Commonwealth government’s finances. That is why Julia Gillard and Wayne Swan are so desperate to move the books back into surplus and out of deficit. PS forget the mittens Crispin in Waterloo, we (in Oz) have much more inviting climate. I can’t help admire Gillard as much as I dislike her for her dishonesty, she certainly is giving it everything to get the carbon tax regime in place. It’s just a shame that she’s working so hard and being so resolute for the likes of Rothschild’s, Goldman’s and others rather than the people she swore to represent. you should realise that the MSM is VERY AGW biased, and sensationalist at that. if the public become less sensitive about the comments in MSM, the percentage is likely to change to maybe 80 % against a carbon dioxide tax. Andrew4 – congratulations to all right-thinking Canadians – shout it loud and clear that MMCC is crap. One tiny chink of light for us in the UK – still labouring under our ‘greenest government ever’ is that eco-loon Chris Huhne, head of our Department of Energy and (for some reason which escapes me) Climate Change, may be headed for the door. But the same survey found 72% thought humans have some influence on climate change. That’s another furphy. Of course human beings have SOME influence on the climate. Every living thing influences its environment. I’m as sceptical as they come but even I agree with that, and so do the sceptical scientists. This is the usual pea and shell trick of stating something completely self evident and then using it to prop up a baseless and disproved theory. This is the most imcompetent and deceitful government Australia has ever had. We’ll be lucky to survive it. We have a new State Premier in NSW. We are to have another 3000 wind turbines to meet the Feds (Gillard) Renewable Energy Target of 20% by 2020. O’Farrell has said however that since RET is adding to electricity and downstream prices the Feds should be compensating consumers. The case for wind is much like the case for AGW, lots of theory and very little reality. The regulators website shows an average 31% power factor which is much higher than overseas. The fact that the Fed opposition, Tony Abbott, has a direct action carbon plan is being used by Gillard as a reason for her to have a tax. Until Abbott takes a stronger stance like the Canadian Harper we will suffer. We also need some real carbon education. Some people are so freaked by “carbon pollution” that they want to eliminate carbon from their diet. Salt water anyone? Most people are not looking at global mean temps. However, they are feeling winters getting colder and not milder as promised by AGW. Rate of sea level rise flattening and so on……………………….. It was always about the money. There is something of a precedent that Ms Gillard and her (Labor) party could do well to contemplate. During his single term as elected Labor Prime Minister (1946-1949), Ben Chifley, no doubt encouraged by the general acceptance of war-time exigencies, tried to nationalize the private banks against vigorous middle class opposition and a High Court ruling but refused to withdraw the legislation and called the 1949 election as a quasi-plebiscite on the issue. His (Labor) government was defeated by conservative Robert Menzies in a massive landslide, still the largest swing against a sitting federal government in Australia — the Labor Party remained in opposition for another 23 years. For Ms Gillard, I’m afraid a Maggie Thatcher “the lady’s not for turning!” stance will be counterproductive, but what else can she do? The so-called carbon tax is not popular, her party and the servile media blaming poor ‘salespersonship’ but they are deluding themselves. The public are not buying it because it stinks. When some one slants a surface temperature record or tree ring data to reinforce their own views on AGW we all ask to see the raw data. When the Australian “newspaper” whom have openly declared their right wing political bias in print, publish figures from their own polls you just believe without asking. I don’t think that is anywhere near good enough, any chance of the Newspoll raw data and how they calculated and collected that figure being posted up here? The interesting aspect the recent Canadian election was the left of centre parties, Liberal, New Democrats and miniscule Greens all proposed either cap and trade or a carbon tax. Other than the Greens the larger parties disguised their environmental policies well hoping not to make it a central issue. When I heard one local candidate answer a question about an increase in gas prices of $.10 per liter a worthwhile price to pay via a carbon tax to save the planet, it was met with a combination of laughter and derision. Thankfully, common sense prevailed and we won’t have to worry about this for four years. The whole world is waking up to the fact of how bad the output of the GCMs really are. They can’t predict thier way out of a paper bag. That is democracy, the right to vote in tyrants to subjugate you. Anti protests get fewer attending than pro AGW, the message that this is a scam isn’t getting through to enough people to make a real difference. Since Gillard lied to get in perhaps Aussie’s could simply drum her out of office. Lock her out of the building or something? Sue her? It must surely make the votes for her null and void. as I am australian our only hope is she will get on a leaky boat and head too the USA as a asylum seeker they can have here along with D.H Rudd. God save australia as nobody else will. If Parliament is still behind Gillard then she could still pass the carbon tax and not be outed until after the 2013 elections? To a distant political observer, Parliament will almost certainly go along with her else face the being outed by early elections if they somehow deadlock. Even the Gov-Gen calling for a double dissolution? It seems the calculus is she’ll lose the PM job in 2013 regardless so why not force it through, ala Obamacare, and spend two years after “passing it to see what’s in it”? Is this even possible in Australian’s system of government? The situation in Oz is I suspect at least partly due to the use of the AV voting system. In the UK we get a referendum on Thursday as to whether we should give up first past the post in favour of AV. The Greens will be hoping for a result that lets them wield as much power as they do in Australia, I for one will be voting no. The ALP would do well to remember Joseph Lyons, Australian PM in the 1930s. He walked across the isle, away from his Labor party, took a number of them with him, and later formed a new party and became PM. Reason: economic policy. Not unlike the present predicament that Labor finds itself in. The carbon(dioxide) tax may achieve the same result, in that a party is split over an issue and loses power for a decade. The issue: a proposed ‘solution’ to a problem that is difficult to measure and not well enough understood, with the result that cannot possibly be measured and will not have the claimed effect. And I am from Canada, and can well remember the decimation faced by the Conservatives after the ill-explained and hastily introduced GST, in 1993. They rose from the ashes, but it was a long time to wander in the political wilderness. At least the GST helped to fill the gap in the budget left by years of Liberal overspending. Folks, the big decisions always come down to money. The Irish know this well, now. If it was a few cents a litre on fuel, no biggie. But to ask for huge sums, to fight something that is so ill-defined, is political suicide. Just back from Prof. Bob Carters presentation here in Hervey Bay. Another excellent delivery of the facts and how the Australian government is conning us. There were in my estimation, about 130 to 150 in attendance. Only one Green alarmist with the same old question, How come all the thousands of scientists and thousands of scientific institutions around the world are wrong and you (Bob Carter) are right. Another warmista shot to bits ! Another silly old goat, about my age, had carbon soot and CO2 mixed up. Showed the effectiveness of the governments ploy of confusing CO2 with (black) carbon pollution. They have at least one person sucked in. By the quality of the questions asked of Bob, I would say that the audience was well informed of the science and knew well that the whole climate change debate is based in lies, fraud and money. I did wear the WUWT shirt and Bob commented that I was brave to wear it around town. I remarked that Hervey Bay is a town of sceptics and I would be safe !! The Australian governments of either persuasion have to rely on the government sponsored scientific organismic – The activist C.S.I.R.O., Activist scientists such as Tim Flim Flam Flannery and others such as Ove Hoegh-Guldberg. There are only a handful of engineers or those with other science degrees in the Australian Parliament. However as I’ve said before. The current governments have led the economy into an ever expanding black hole. They need this tax – any tax to try and rein in the deficits from their failed or bizarre policies. In the sense that the UK political elite seem to take the alarmism hook, line and sinker the nonsense from the BBC, Guardian and that sin-bin of nonsense: the Met Office, yes you are right. But more “hopeless” as in we public have no hope of ever getting anything better from politicians. But in the sense that things will not change: very far from that. I was on the other side at the end of the 1990s and I can say it was the same feeling. We couldn’t understand why the government weren’t responding to the obvious rise in temperature. It took many years for them to finally catch up with public opinion, and now that opinion has certainly changed as most people have realised that this is almost entirely based on rather dubious interpretations of highly partisan and dishonest “scientists”. But we’ve got to expect our politicians to take their time catching up. Everything is against them. They’ve told so many lies that almost anything the weather does is a contradiction of what they predicted! As for the BBC. There are undoubtedly a few very red faces who know the BBC went way way way over the top on this subject and who must now wish that they could erase every single news story, weather comment & documentary that ever mentioned global warming. Interestingly, here in the U.S. I’m starting to encounter Liberal democrats who don’t believe in man made global warming. It seems that people hear one of two responses to the request “show me the data:” 1. Sure. There’s nothing to hide. Here it is. Let me know if you find a problem. 2. NO! I faked it and I don’t want to be caught out. You’re evil! It is truly amazing the things that happen when people fall asleep at the wheel. If they wake up they tend to be surprised (and a number of other things) too. Julia needs some new advisors – I hear that Michael Ignatieff is looking for a job. He could give her a first hand account of how these things work out. Bruce mentioned the 1993 Canadian election – that was the one where the Bloc Quebecois rose to prominence. Interesting that even more than the Liberal Party, the Bloc’s support totally collapsed this time, going from 47 seats to 4. Stick a fork in ’em. Looks like the money they spent on Carbon Offsets should have been spent on connecting with their voters. Some background, the NDP is Canada’s far-left party, now surprisingly the official opposition after decades of existence as a 3rd place party. Thanks for the comment, there’s a Scottish election sometime soon and personally I will only vote for a party with a sensible policy on the climate. Which as the conservatives are behaving like total spankers means UKIP.
. Could somebody please tell the sheeples of British Columbia when nobody follows, you aren’t leading?!?!? Simple economic analysis would clearly show that the Net Present Value (NPV) of any expenditure now to receive benefit in 100 years is essentially zero, regardless of what discount rate you use. This is a powerful argument that should be made more frequently. Regardless if you think AGW is real or not, any rational, unbiased economic analysis will show the NPV of trying to “solve” the problem to be next to nothing due to the time frames involved. The only rational way to proceed from an economic analysis standpoint is to adapt to any change that may (or may not) occur. Perhaps it’s just me becoming grumpy in middle age, but it seems to me more and more politicians are content to blatantly lie to win an election and not really try to pretend they didn’t once they’ve been elected. It cannot be acceptable for Gilliard to behave in this manner, yet she will probably continue to do so, as her contemporaries place their own interests far ahead of the people they claim to represent and wouldn’t want to risk another election. Congratulation to Jo Nova and the rest down under for the hard work they have put in turning the Aussie heads away fro Gilliard and the Greens! It looks like Gillard is having a George Bush SR read my lips moment with some Nancy Pelosi’s we can do anything we want attitude. It is obvious the goal here is not representation but the dictatorial power of a political party with the intent of redistribution of wealth based on the fraud of climate change theory. Once the laws and regulations are in place it will be difficult to undo, and they know it. NPR and the New York Times were eagerly pushing Harvard professor David Ignatieff on the Canadians and touted his support for cap and trade. His candidacy has resulted in the demise of the Liberal party. The liberal media which greatly influences the democratic party in the US is whispering the results to party leaders. Meanwhile food and energy prices may become a main opposition platform. just beginning due to global cooling. George Monbiot of the left-leaning British newspaper The Guardian has a must-read column in which he admits that because of a whole series of intellectual mistakes, the global green movement’s policy prescriptions are hopelessly flawed. Read the whole piece for a thoughtful and brutally clear expose of the intellectual bankruptcy of the green movement from one of the smartest people in it. This is what I’ve been getting at for more than a year here: regardless of what is happening to Planet Earth, the green movement does not have coherent and workable solutions. The cracks have become fissures. All governments have always have too little money. Some just print more but that is not a good solution. (Due to expirence). Tax on ‘greenhouse’ gases is like a Christmas gift from heaven. If made global NO ONE is to blame locally. Temperture was never an issue, and will never be … Just wait we will all have a gas meter on an appropiate place to measure our released gases, and the tax bill will be sent automatically after automatic processing when we pass reading points. The greens are having a field day,they have Ms Gillard in a vice,busily turning the handle.How much will they get?A lot is my guess. THE Australian Greens want measures to boost investment in large-scale renewable energy projects in exchange for supporting the federal government’s carbon tax. Greens climate change spokeswoman Christine Milne says loan guarantees and a floor price for carbon when a tax moves to an emissions trading scheme are crucial to providing investment certainty for big renewable energy projects, Fairfax newspapers report. “The Greens are now stepping up the pressure for these policies in our discussions with the government and with the independent MPs,” Senator Milne will tell the Clean Energy Week conference in Melbourne today. “You think you’re discussing technologies, and you quickly discover that you’re discussing belief systems. The battle among environmentalists over how or whether our future energy is supplied is a cipher for something much bigger: who we are, who we want to be, how we want society to evolve. Beside these concerns, technical matters – parts per million, costs per megawatt hour, cancers per sievert – carry little weight. We choose our technology – or absence of technology – according to a set of deep beliefs: beliefs that in some cases remain unexamined. There it is. One of the leading British advocates of CAGW acknowledges that the warmists are discussing belief systems, not future energy. Mods, this admission may be worthy of its own thread. Without any preconceptions about CO2 and climate change, there is a good deal to be said for caution when it comes to making radical changes in the chemical composition of the atmosphere. Beside any impact on the climate, the current rapid anthropogenic increase atmospheric concentration of carbon dioxide is having major impacts on the biosphere, the full extent and nature of which we cannot with complete confidence predict. Under those circumstances, a carbon tax makes good sense. It is the most efficient mechanism for limiting carbon emissions, i.e., it gives you the biggest emissions reduction for the dollar, as Ross McKitrick — no climate alarmist he — has long argued. McKitrick has further proposed linking the rate of the carbon tax, not to some arbitrary target CO2 concentration but measured temperature changes. I am skeptical of the merit of the latter proposal, however, since it does not take into account natural variation in temperature that may conceal important and potentially detrimental longer term anthropogenic effects. Moreover, it takes no account of the principal impacts of CO2 on the biosphere. Note particularly the progression of alarm as more money is involved – starting with a small Climate Theory from scientists to dangerous Climate Change from UN’s IPCC to Climate Fear from Government’s spokesmen. Note also the unbalanced outward radiation of taxpayer money, which will very likely cause dangerous cooling of family finances. After initializing and parameterizing hundreds of unknowns factors, inserting divergent proxy data and ignoring any difficult natural forcing factors, we ran hundreds of simulations until we obtained the results we wanted – an ensemble of meaningless projected results, which we then averaged. We homogenized, adjusted and used liberally unprincipled component method, too sophisticated for non-climate scientists to understand, and produced a new set of hockey sticks, giving a very robust prediction (>90% likelihood) that we are all being totally screwed (right). Canadia has been vacinated against the green dragon carried virus for 4 years. It will remain to be seen how Carbon crisis cartel can fight against the laternative media that lets us know that there is nothing to fear. I second that! Good On Ya, Mates!!! Keep turning up the ‘heat’ on their globular warming nether regions! A carbon tax makes no sense. China, India, Russia, Brazil, and a hundred other countries have absolutely no intention of restricting their growing economies by reducing “carbon” [by which the scientifically illiterate mean CO2, a harmless and beneficial trace gas]. The U.S. and the West could reduce their CO2 output to zero, and the void would be promptly filled by the developing world. A ‘carbon tax’ is simply a new TAX. And taxes are already far too high. You’re worried about the anthropogenic portion of CO2, which is only about 3% of all the CO2 emitted. 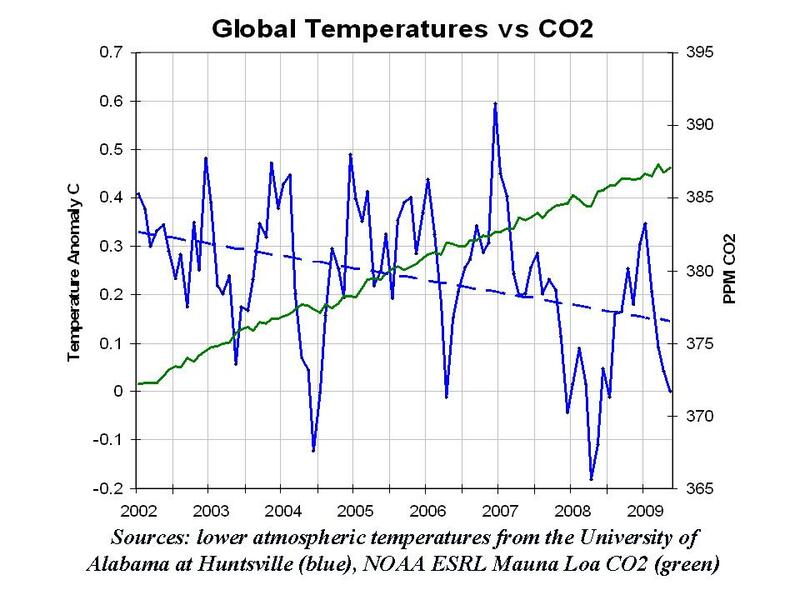 Furthermore, over the past decade temperatures have been flat to declining, while CO2 continues to rise. That falsifies the claim that CO2 drives temperature. CO2 may have a tiny effect on temperature, but it is inconsequential, and there is no evidence whatever of any global harm or damage due to the rise in that tiny trace gas. However, CO2 is having an effect on the biosphere – an entirely beneficial effect. Conclusion: the rise in CO2 is both harmless and beneficial. Analyze with facts and evidence, not with emotion – and ignore the money-fueled propaganda, which is designed to get you to open your wallet to government kleptocrats. That reminds me of A. E. Van Vogt’s 1944 science fiction story “Far Centaurus”. An Earth crew embarks on a multi-century voyage to Alpha Centauri, only to be greeted by other humans who made the trip in hours. Whether a carbon tax makes sense depends on the context. I agree that any country acting alone might bankrupt itself cutting carbon emissions without having much impact on atmospheric CO2 concentration. A policy I have advocated, in the absence of international agreement, is a carbon tax combined with a countervail duty on goods from countries without a carbon tax, e.g., China. The implications are complex, but quite interesting, especially for western countries where jobs are being wiped out en masse by competition from China, the world’s greatest emitter of CO2. But the economic implications need consideration. Raise the price of energy, you cut energy use. Cutting energy use will promote investment in energy efficient technology, which is probably desirably during an era of mass unemployment in the West. At some point, cutting energy use will begin to reduce economic output. But it will also will lower energy prices, which reduces the monopoly profits flowing to unstable ME countries, which seems like a desirable end. These are questions that should be explored, not be dismissed out of hand. As for “by which the scientifically illiterate mean CO2, a harmless and beneficial trace gas” you display a certain scientific ignorance yourself. To call “CO2 harmless and beneficial” is, under some circumstances, clearly false. What those circumstances are, is the subject of research. At what concentration does CO2 significantly impact human physiology? At some point it is lethal, at lower concentrations it impairs physical and mental performance. What are the thresholds for such effects? Plant growth responds to carbon dioxide concentration, but some species respond more than others. What are the consequences for biodiversity of the change in competitive environment created by, say, a doubling of atmospheric CO2 concentration? Jim hogg. You beat me to it. Joolya must be well educated even if she articulates her views very poorly while her vocalisation is appalling. (Back of Burke speech). But for all that I believe her to be quite intelligent so one has to consider her motivation. She is a socialist. Socialists believe that they know how to manage the world better than anyone else. Work it out. It is because the public is waking up to the fact that folks like you operate on emotional belief systems, rather than on logic and empirical evidence. You’re scaring yourself with baseless “what if” scenarios. FYI, the U.S. Navy allows CO2 concentrations of 5,000 ppmv 24/7/365. I know, because my boy was in a nuclear attack sub for most of his 6 years in the Navy. The air in many offices and factories is routinely over 1,000 ppmv. CO2 at those levels is harmless. Note that even with a doubling of current CO2 levels – which isn’t going to happen – the concentration would still be far below 1,000 ppmv. And yes, C-4 plants react differently than C-3 plants. So what? They all benefit from more CO2. In a world of rising food prices, and where one-third of the global population subsists on $1 a day or less, the added CO2 is an unmitigated good. For your pie in the sky demonization of “carbon,” you would happily condemn plenty of folks to starvation. But in totalitarian greenworld, that’s A-OK, because the end justifies the means. Pol Pot would understand perfectly; he made Cambodia a perfect “green” example by depopulating most of the country. I suggest you do a search of the WUWT archives for “CO2” and “carbon dioxide”. Get up to speed on the actual science, rather than buying into the emotional scare stories that rain down on everyone day and night, like the crowd of lemmings who believe everything they’re told by TV talking heads, Hollywood actors, and failed Presidential candidates. Ah … but the masses aren’t real bright down under. They actually voted in a new government when promised a new tax that would “save Australia” … the GST. I think it’s happening right now where you are, but not over here. I think $8.50 AUD for a Big Mac is not quite enough. I’ll be attending the No Carbon Tax rally in Brisbane on May 7th wearing my NO CARBON TAX tee shirt. People are now listening, the media has more stories but Julia Gillard is still trying to push the tax through. 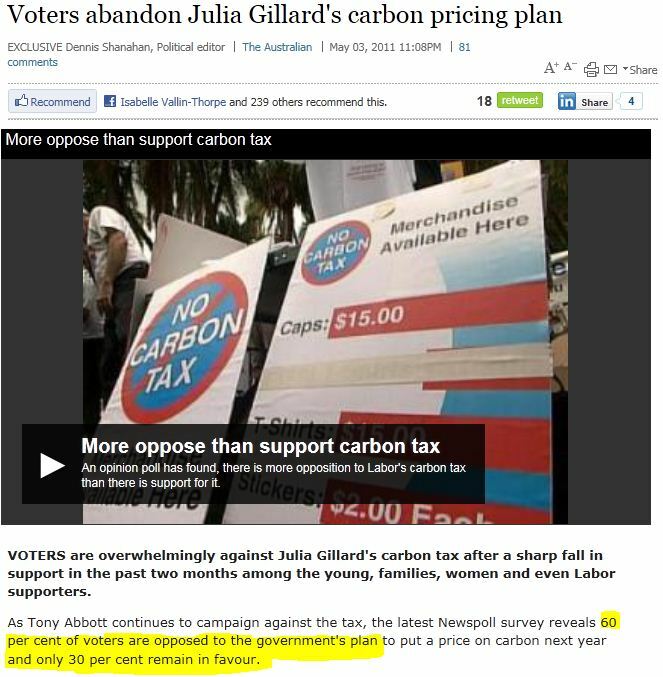 The polls show little support for the tax and a bit less support for Julia. I guess Oz was probably a major starting place for the greens a couple of decades ago – and I know my cousins ex-husband was a major player 10/15 years or so ago – but he was a complete muppet and incapable of thinking stuff right through – but nevertheless managed to get himself elected on the green ticket, and I believe many ‘innocent’ aussies seemed to fall in line and take the green ‘pledge’. I doubt any ever realised the BS and the long term problems they were generating for themselves. But hey, they have twigged it now and I just hope they can overturn the crass policies being inflicted on them…..
Canspeccy, to say “At what concentration does CO2 significantly impact human physiology?” on this forum is simply trolling. You can look up the number, you can easily see that it has no resemblance to the anthropogenic emissions. Likewise you claim that our changes are “radical” is an exaggeration. However you are correct about a carbon tax being the least bad option. It gets rid of the whole scam of carbon offset trading. However you would also have to agree that the owners of the carbon (energy shareholders like myself) must be compensated for our losses incurred by taxation. Agreed? Otherwise no dice. Sounds like something that Charles I of England said – before the Brits chopped his head off. Aussies, soon will be your chance to play like the Irish voters, and eviscerate your Labor party. For they will not understand until you eviscerate them. INDEPENDENT federal MP Rob Oakeshott has pledged to base his final decision on whether to support Labor’s carbon tax on evidence, rather than the views of his constituents, saying to do the latter would be nothing more than populism. Mr Oakeshott said he would have failed his electorate if he followed his constituents’ views over those he thought were right, and that he was not scared of losing his seat as a result. I guess he doesn’t understand what a democracy is and that he better start looking for a new job. which is merely a bald statement of your conclusion without any evidence. Here you support a sweeping assertion based on an irrelevant statement about two widely disparate groups of plants about which I had said nothing. All other things being equal, rising CO2 concentration will most likely increase productivity of many crop plants (though not, I predict, rice), but where will that get us: to a global population by 2100 of 15 billion instead of the predicted ten billion? You call that an unmitigated good? My chief point was, and this is also Ross McKitrick’s point, that if you want to limit carbon emissions (yes I am sufficiently scientifically literate to know that combustion yields CO2, not pure carbon) then a carbon tax is the cheapest way to achieve a particular target. And there are benefits to a carbon tax aside from any that result from a reduction in carbon emissions: namely, scope for offsetting reductions in other taxes, e.g., income tax, a reduction in the flow of resource revenue to unstable ME and African despotisms, and a delay in the exhaustion of conventional oil and gas reserves. Perhaps he merely has a view of democracy that differs from yours. Your assumption that the mass of people have a clearer idea of what is in the interest of their community than a distinguished individual who has been chosen to represent them and who has devoted time and study to questions of public policy is evidently, even today, not accepted by all parliamentarians. I’ve got a pretty strong feeling that particular course of action won’t turn out quite how they expect it to, should they choose to pursue it. Keep digging, deconstructing your provably wrong statements is fun ‘n’ easy. I provided evidence: my boy, who served in the USS Helena, a fast attack sub, reports that CO2 levels below 5,000 ppmv are considered harmless for extended periods. If you disagree, go argue with the Navy. And as I stated, many offices exceed 1,000 ppmv. This isn’t realclimate or climate progress, where scientifically ignorant head-nodders pass on equally silly talking points – and get away with them, because those echo chambers censor out corrections and opposing points of view. This is the internet’s “Best Science” site, where false and/or scientifically untenable statements are promptly debunked. The US Navy is not a scientific authority. The fact is, there is very little research on the effect of carbon dioxide on human performance. That 5000 ppm is not lethal does not say anything whatever about the threshold for physiological effect. So if you want to argue the science, maybe you could give us the scientific references. Or is it the case that in your world of “fun ‘n easy” determination of the truth, the scientific literature is a needless distraction. But for morons, I suppose there’s nothing to worry about in changing the chemical composition of the atmosphere so long as it is not immediately lethal. On further thought, I should not have used the word “morons”. I do not wish to create acrimony. However, I am puzzled by the apparent determination of some to trash every expression of any concern for the consequences of human action on the environment, however, tentatively those concerns are expressed. Humanity is possessed of the capacity for reflection and anticipation. We should should surely exercise those gifts. In a world of billions and a growing world economy, the human environmental impact will surely become detrimental at some point if it is not already. We should think about that. For example, if the global economy were to grow at 3% for 100 years it would reach about $one quadrillion in constant dollars or about 20 times its present size. If energy consumption increased proportionately, we’d need nearly two billion barrels of oil a day, which would clean out Saudi Arabia in about a year, the Canadian tar sands in another year, the rest of the world in four or five years. The environmental impact of all that carbon added to the environment would surely be spectacular, which is not to mention twenty times present day pollution from coal and gas, etc. At some point we will have to limit these impacts. It is surely sensible to start thinking about it now. They might disagree with you at Annapolis. So if you don’t accept the Navy as being an authority on the effect of CO2 on submarine crew performance, you probably won’t accept any authority. There are reams of data on the effect of CO2. I’ve pointed you to the industry standard MSDS resource, in addition to this link. If you bother to get a little knowledge you will understand that atmospheric CO2 levels are simply not a problem. CO2 has been up to twenty times higher in the geologic past, and the biosphere thrived. At current and projected concentrations, atmospheric CO2 is completely harmless. Burning every last barrel of the world’s oil could not double CO2 levels from here. You say that the “environmental impact of all that carbon added to the environment would surely be spectacular, which is not to mention twenty times present day pollution from coal and gas, etc.” That is just an emotional conjecture based on non-science. CO2 is not “carbon,” and it is not “pollution.” It is a tiny trace gas essential to life on earth. Your claim that CO2 could rise twentyfold over the next century shows a complete lack of understanding of the issues. Finally, the free market, if allowed to operate, will efficiently allocate energy resources as it always has. Yes, the price will rise, but the world will not run out of oil. In fact, Forbes magazine just ran a story [4-25-11] on solar heated steam injection into depleted wells, which will allow the recovery of at least 300 billion barrels more oil in the U.S. alone. Human ingenuity can easily solve our energy problems. The real problem is the truly evil enviro-lobby, which fights tooth and nail against any and all new production of desirable, efficient fossil fuels. The eco-Malthusians do not care how many of the world’s poorest starve as a result of their obstructionism; the end justifies the means. And their goal, my friend, is a massive culling of the population. AKA: genocide. These eco-Luddites push for inefficient, wasteful and silly ideas like windmills – a pathetic energy source that would die on the vine if it didn’t receive enormous taxpayer subsidies. They are so misguided that they believe that hobbling the economy will benefit the average citizen. They are totally wrong. The really scary part is that they can vote. I didn’t say that. That US submariners operate at 5000 ppm CO2 merely proves that it is possible to function in such an atmosphere. It says nothing about the impact of such an atmosphere on performance relative to performance at 370 ppm. The concentration of CO2 in a submarine will reflect a compromise among various factors including human performance and the size and cost of the equipment necessary to scrub CO2 from the ship’s atmosphere to concentrations below 5000 ppm. That seems to be incorrect. Proven oil reserves are around 200 billion m^3. So let’s say there’s nine times that much still to be found (you’d probably say more). Burnt, it would yield 7.3 X 10^12 Mg of carbon dioxide, or more than 3.5 times as much CO2 as is currently in the atmosphere. So burnt all at once, it would raise atmospheric CO2 concentration by about 1300 parts per million. If oil consumption were to grow by 3% a year for 100 years, the annual use would total about 4.5 X 10^11 Mg per year, at which rate it would take just 4.4 years to increase atmospheric CO2 concentration by the amount currently in the atmosphere (ca. 370 ppm), assuming negligible sequestration of the added CO2. What the actual rate of sequestration by geologic and other processes is seems obscure. I once asked a number of experts in the climate science field but got no satisfactory response. I doubt if anyone really knows — wow, a whole new field of modeling for the climate science guys. In addition, there might be several times as much CO2 added to the atmosphere through the combustion of natural gas and coal, which are much more abundant than oil. Which one is the sock puppet? And how many more are there? FYI, sockpuppetry is not admired here. I am using different machines that automatically log me in. I had not notices the change of id. Canspeccy is my blog, which is the name I thought I was using here all along. So hope that dispels your paranoia. Now to the facing the facts you have wrong. If the only way you can try to score a point is to put make-believe words in my mouth, your argument necessarily fails. I wrote verbatim: “Burning every last barrel of the world’s oil could not double CO2 levels from here.” I meant that literally, and I am careful with words. So quote me exactly; don’t fabricate my statement by implying that I meant there is 900% more oil. That is your prevarication, and I don’t agree with it. By arbitrarily inflating my statement by 9X, you then claim a 3.3X increase in CO2. I’m a little bit astonished that you actually believed that would fly under the radar here. This isn’t the realclimate echo chamber, where your shenanigans might gain traction. Inventing fictional numbers on which you base your argument fails. And it strains credulity to presume that the U.S. Navy would make a trade-off between an alert crew and a trace gas, if the Navy thought it was harmful. You questioned the reliability of submarine personnel operating in higher than average CO2 atmospheres. Since you made the statement, provide convincing evidence of your conjecture – or admit that the Navy knows more that you do about the harmlessness of CO2 under 5,000 ppmv. The result of a mistake-prone submarine crew due to CO2 could be a nuclear WWIII – if that were the case, which it is clearly not. Further, you avoided both the MSDS and the Minnesota public health links I provided, which refute your belief that current or projected CO2 levels are a problem, you denigrated the Navy as being unscientific, and you accused it of compromising safety. Could you be less credible? Not unless you really tried hard. Finally, I have provided a convincing argument that CO2 is harmless: show us any convincing, testable, empirical evidence showing that global damage has occurred due specifically to the rise in CO2. If you do, you will be the first to do so, and you will be on the short list for a [now discredited] Nobel prize. In fact, there is no such evidence. None. Therefore the null hypothesis rules, and CO2 must be accepted [barring any new evidence] as a completely harmless trace gas. 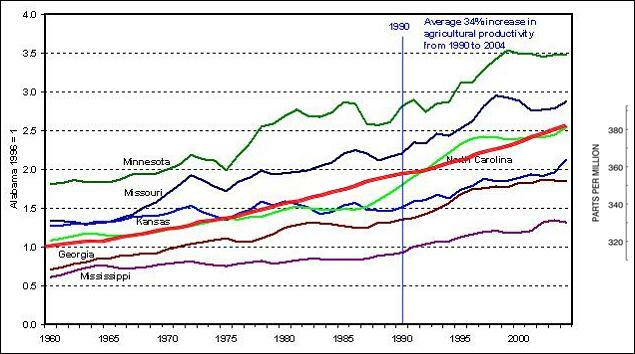 However, there is strong empirical evidence showing that CO2 substantially increases agricultural productivity. If you would like to see that evidence, just ask. Conclusion: CO2 is both harmless and beneficial. More CO2 is good. I know that rocks your belief system, but here at WUWT the scientific method rules. CO2 is harmless, and beneficial. Deal with it. I wasn’t arbitrarily inflating you statement. You talked about burning all the oil there is. To estimate how much CO2 that would produce, you have to estimate probable as well as proven reserves. I estimated probable reserves at nine times proven reserves. I assumed you would claim the ratio to be higher than that. If you think it is less, you could have told us what you think it is. Pointless, to continue the discussion. I accept your concession statement. By previously asserting that “I estimated probable reserves at nine times proven reserves,” you mis-attributeed that fictitious number to me. That was, of course, false. And as always, you avoid the plain fact that CO2 is harmless and beneficial. If you want evidence that CO2 is clearly beneficial to the biosphere, just ask. Actually I wish Ms. Gillard all success in pushing through her carbon tax/carbon trading scheme. This will offer several clear benefits. 1. It will crush Australia’s resource based industries, driving up the price of commodities yet further for the benefit of all those economies, such as that of my country, as a free rider on Australia’s misery. Because of the large administration required for it, it will increase public service and decrease the private sector, reducing Australia’s productivity. Again this works to the benefit of all other nations with resource based economies. 2. As the first nation to actually implement such a policy, Australia will serve as the great ghastly example of what not to do. Thus far, questions of adverse economic impacts have been largely theoretical. Australia will serve as a useful test case as to how destructive it really is. 3. If the tax is effective then it will be universal. And it will thus conclusively demonstrate just how regressive it is. 4. The claims of revenue neutrality will finally be shown for the lies that they truly are. Never in the history of mankind has there ever been a revenue-neutral tax. Such claims will certainly add yet another patina of mendacity to the already thick tome of falsehoods uttered over the years by the Green machine. 5. The economic horror inflicted on Australia will be more than sufficient to exterminate Labour at the next election and banish Ms. Gillard to electoral hell. In politicians minds the operative word is ‘tax’. Not ‘carbon’. All politicians like tax. It’s like having their own big pot of money that they can dip into and distribute to those they see as ‘worthy causes’ aka ‘voters’. They like doing this. A happy voter with tax money in his pocket is more likely to vote for the politician. The only problem is that other people don’t like paying taxes to start with. So any excuse will do for a politician…if they can make the payer willing to pay. If today’s excuse is to save the planet from thermageddon, that’ll do fine. Tomorrow it might be that the tax will be used to build vast thinking machines that’ll scare off the vast invading alien hordes from teh outer planets. The actual excuse is immaterial, so long as people believe it. But it will, in fact, affect all industries, some more energy reliant even than resources, e.g., airlines. Further, why will a carbon tax, any more than any other tax, crush these industries? Australians use approximately 6000 kg of fossil fuel per person per year, so a carbon tax at the rate of, say, 4 cents per kg, as currently applied in the booming resource-based Province of British Columbia would total about $240 per person. A significant charge, but quite small given that western states currently impose taxes equal to 40 or 50% of GDP. And in fact, a carbon tax may have no impact on the overall level of taxation despite Latimer Alder’s cynicism, since it may be applied on a revenue-neutral basis, e.g., with a compensating reduction in income tax, as Ross McKitrick has urged. Further, if a countervailing duty on imports from countries without a comparable tax, then there should be no negative impact on overseas trade. And, as indicated above, Australia would not be blazing a trail, but following the lead of British Columbia, which has a strongly pro-market and free enterprise government. Your idea that there is some universal law against tax reductions, which negates the possibility of a revenue neutral carbon tax is mistaken. If you follow the history of taxation in a country such as Britain where left and right governments have alternated over many years, you will see a consistent pattern or alternating tax increases and reductions (as a percent of GDP). “B.C. now has the lowest income tax rates in Canada for people earning up to $118,000, B.C.’s corporate taxes will be the lowest in the G7 group of countries, and B.C.’s small business tax rates will be the lowest in Canada by 2012.